I'm very sorry that i haven't had time to make any new ponies in the last year or so, I've been super busy at University and pursuing little side projects in my spare time. I am writing to ask for a little help from all my lovely pony friends, I recently entered a competition with Trollbeads (a charm bracelet company, they make beautiful quality beads) and have made it down to the final 100 entries. This is where I need you! The final 100 need voted on to determine the winners. Koi fish are a symbol of friendship and love. The Koi Pond bead depicts a silver Koi leading out of it's pond. 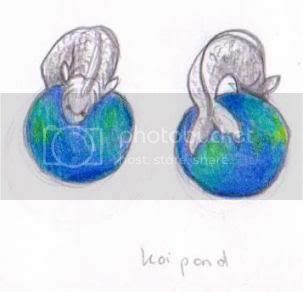 The Koi itself is made from 925 silver, the bracelet threads under his belly, so he is majestically leaping over your bracelet to get back into his glass pond. The tranquil pond is swirly hues of blues and aqua greens. I wonder how many other Koi fish are in there ready to leap out? If you click the link below you will be taken to the page of finalists where you can vote for me (scroll until you find my thumbnil), if you like my design of course! I would be so grateful for every single vote you can spare. To vote you must have a Trollbeads profile, this only takes 2 minutes to sign in and all they do is send you the occasional newsletter via email - no spam I promise! The winners of the competition have their bead produced for manufacture and general purchase for the public! Please post below if you decide to cast a vote for me - I'd like to be able to thank everyone personally. Thank you so much for your time, I promise to bring you some new ponies soon. 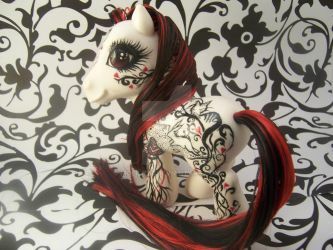 Woow all your custom ponies are amazing! I hope you'll take commissions again one day! Hi, I am sure you have a loooong list of requests for ponies, but whats the chances of getting 2 of the Ebony or Pride ones??? These are amazing!! You are amazing!! I love the ponies you make. Hoe much would it be to get custom ones? The detail is awesome on them.